What a year for our Association! One hundred years ago No 44 Squadron was formed at Hainault Farm, near Ilford, Essex under the command of Major T O B Hubbard AFC. Initially equipped with obsolete Sopwith 1½ Strutters, these aircraft were soon replaced by Sopwith Camels and the Squadron was tasked in the night fighter role to oppose the German night bombing campaign against London. By the end of WWI the Squadron was commanded by Major Arthur Harris, later to become the redoubtable Air Officer Commanding RAF Bomber Command in WWII. 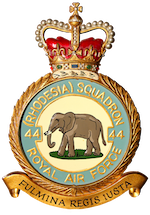 In 1941 the Squadron was renamed No 44 (Rhodesia) Squadron in honour of the Rhodesian contribution to Britain’s war effort. It also recognised that up to 25% of the air and ground crew were Rhodesian. The badge is based on the seal of Lobengula, the chief of the Matebele, and the elephant symbolises heavy attacks. The rest of the Squadron’s distinguished history is meticulously recorded in ‘The King’s Thunderbolts’, an excellent operational record and roll of honour. If anyone has yet to read this book, it comes highly recommended and copies are still available from the Secretary. As if the centenary was not enough, this year also marks the 75th anniversary of the famous raid on the U-boat engine factory at Augsburg. This operation exacted a cruel price: five of the six Squadron aircraft taking part were destroyed. For his outstanding skill and courage in leading this raid the then Flight Commander, Sqn Ldr J D Nettleton, was awarded the Victoria Cross. In June of last year the last surviving member of Nettleton’s crew, Pat Dorehill, sadly died. We are fortunate to have been given a copy of a personal letter Pat wrote to his parents just after he took part in that calamitous operation. The reunion, in this our centenary year, takes place over the weekend 5th, 6th and 7th of May. Once again, we are extremely grateful to the Station Commander for welcoming us back to RAF Waddington and putting many station facilities at our disposal. Being a rather special occasion this year, we are expecting a really good attendance and members are advised to book early to avoid disappointment. Please complete the enclosed booking form to secure your place at the various events and return it, with your remittance, to the Secretary. Also do let the Secretary know where you will be staying. The outline programme of events appears below. Further details, timings and transport schedule will be included in welcome packs which will await attendees on arrival. Friday 5th May. The opening event, the Meet and Greet, will take place in the Officers’ Mess, RAF Waddington, starting at 7.30 pm. Saturday 6th May. Assemble at the Officers’ Mess car park at 11.00 am prior to being escorted to Station Headquarters for a group photograph in front of Waddington’s memorial statue. Lunch will be taken at Mill Lodge on Canwick Hill, Lincoln, before moving across the road to visit the International Bomber Command Centre at 2 pm. Saturday’s programme will conclude with the Annual Dinner in the Sergeants’ Mess at RAF Waddington. Heightened security means we will all have to be escorted onto the base, so we will meet up at the Officers’ Mess car park at 6.30 pm. Sunday 7th May. At 11.00 am on Sunday morning there will be a service of remembrance in the Memorial Garden at RAF Waddington. Hopefully, the service will be conducted by our Padre, the Reverend Ian Partridge , with accompanying music by the RAF Waddington station band. The concluding event will be Sunday lunch at the Pyewipe Inn, Saxilby Road, Lincoln. The annual 44 Sqn Golf Match is now a well-established event which has been de-coupled from the annual reunion so more of our golfers are able to take part. Last year’s tournament was won by Paul Taylor, the sole navigator among a motley collection of ex-Vulcan captains. The pilots are bent on exacting a terrible revenge this year and the contest will take place on 26th April at Belton Park, teeing off at 11.00 am. Players might wish to assemble in the clubhouse at 10.15 am to steady their nerves with coffee and sandwiches. Post-match nourishment could well include pies and chips, washed down with local ale. The organiser and tournament director is, once again, Kevin Lawry. Anyone wishing to play should contact Kevin at kjlbus@gmail.com, or by mail to Piran House, 5 Pond Street, Harlaxton, Grantham, NG32 1HW. Annual subscriptions (£10) were due on 1st November. If any member has inadvertently forgotten to pay what remains a modest amount, please do so to the Secretary as soon as possible. Aviation Heritage Lincolnshire are sponsoring a talk on the Augsburg raid at the Petwood Hotel, on the 9th April 2017, at 2.30 for 3 pm in the Dambuster Suite. The talk will be given by Andy Johnson. The Petwood Hotel is located at Stixwould Road, Woodhall Spa, LN10 6QH.